Does anyone else find shopping for the man in your life tricky? They’re not always the most forthcoming with lists or ideas. Most, in my experience, just give a shrug or, the worst answer possible; ‘anything’. Shopping for your boyfriend, partner, dad or that cute guy at the office you’ve been eyeing up all year can be pretty nerve wracking, no matter how well you might know him! I always want to wow them, blow their polar bear socks off and make it a gift to remember. 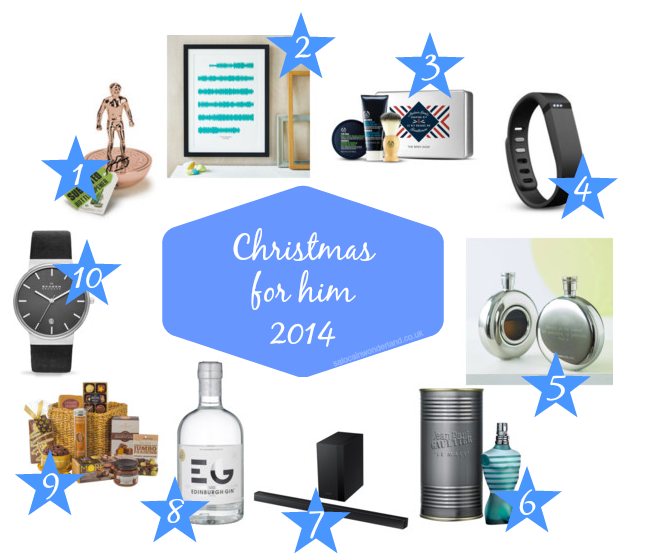 Here’s a run down of my top gift picks for men for Christmas 2014! My Dad was a huge Subbuteo collector when he was a kid. If he couldn’t go out on the pitch for real, he would bring the game indoors and spend hours putting his team together, positioning them, then flicking them about. He would create his own leagues and championships - he was an imaginative kid! This copper Subbuteo bottle opener would make a great gift, both nostalgic and functional, pair it with the latest shirt from his favourite club or tickets to a match. If your bloke loves his music, this will mean more to him than a set of Beats! Take his favourite song and have the music turned into visible sound waves that he can display in his man-cave. I love the idea of taking either his favourite song, or one that means something to the both of you and being able to display it like this. It makes a cracking and unusual piece of wall art, it’s certainly eye catching and a conversation starter - in fact, if someone asks; ‘what’s that?’ you can answer them by simply playing the song. Who said gift sets are just for girls? Guys groom too, so if your guy shaves, regularly or just on special occasions, make it the best shave yet with this dapper set from The Body Shop. Complete with shaving foam, post shave cream and a vintage style shaving brush, the tin makes not only great storage but a very manly looking gift too. Consider pairing it with a new razor or a gift card for a professional close shave at a local barbers. He’ll love the pampering experience and you won’t be able to keep your hands off that freshly shaven smooth skin. This was on my gift guide for him 2013, and I’m brining it back for 2014! Not only is it £20 cheaper this year, it’s still one of the best gadgets for any fella who is into fitness. It’s an easy way for him to track complete his fitness related new years resolutions. It tracks calories burned, steps taken, distance travelled - and it doesn’t stop there. If he wears the Fitbit to bed it will track his sleeping pattern too and comes with a build in alarm that quietly vibrates to wake him - perfect if you both have separate wake up times! Does the man in your life like a nice tipple? I love this windowed hip flask with it’s shiny stainless steel casing, and the option to have a personalised message put on the back. It comes in a sleek black presentation box, so it’s good to go as soon as you’ve received your delivery! This makes a great, sentimental but functional gift. Pair it with a bottle of their favourite whiskey or bourbon and I can assure you they won’t stop smiling (though that could also be tipple-induced!). Most guys pick a fragrance and stick with it for years unlike most women I know! Maybe it’s time for a change, or maybe you love their classic fragrance as much as they do and it’s time for a top up, either way, you can’t go wrong with popping a bottle of scent under the Christmas tree for them this year! I love Jean Paul Gaultier, but that could be because it’s Mr’s fragrance and I couldn’t imagine him wearing another scent! Well, these seem to be something of a big deal this year! Whether it’s for films, TV or even gaming, I’ve heard a lot of guys talking about wanting to find one of these under the Christmas tree this year! Personally, I’m a Samsung fan girl, I’ve always found their products to be a high quality build and if they can survive me, they can survive anything! Wireless sounds like a good option to me, I can’t stand having wires all over the place, wireless just looks much tidier! If you do buy these for your guy, you might want to consider some noise cancelling headphones for yourself! I’ve actually tried the berry infused version of the Edinburgh Gin and, oh me oh my, it’s delicious. 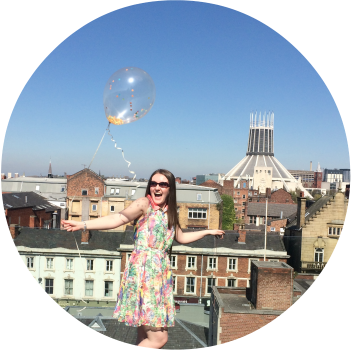 A single measure over a glass of ice is absolutely delicious, a drink that’s certainly supposed to be savoured and enjoyed, not binged over a weekend. Christmas is the perfect time to give that Mr in your life a special bottle of something (possible pair it with the hip flask) that you can both share and enjoy well into the new year. I love Christmas hampers, don’t you? If your guy is a foodie, or has a real sweet tooth, this pre-made chocoholic hamper is perfect, filled to the brim with indulgent delights - if you’re lucky he might even share them with you! Another great option would be to create your own hamper for him, hand picking all of his favourite things and putting them together to make a uniquely personalised hamper. Christmas is the perfect time to gift your man a classical time piece. I adore this watch by Skagen, it’s sleek and stylish without being overly chunky or flash. I prefer something more under-stated like this on a man, it’s so classy and makes the perfect dress watch. It’s easy to read and the soft leather band will make it a comfortable wear. Have these suggestions given you any ideas for what you might buy the special man in your life? Let me know in the comments below what he might find under the Christmas tree this year! Brilliant! Glad it reminded you! I think that's what my Mr will be getting this Christmas too!